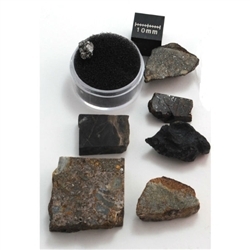 The biggest variety of the 3 meteorite kits. Included in this kit is an iron meteorite (Campo Del Cielo from Argentina), 2 polished pieces chondrites (from Northwest Africa), a tektite (Meteorite glass), Polished piece of Breccia (Earth rock changed from a meteor impact, Alamo bolide impact), A polished piece of NWA 869 (some meteorites are formally analyzed by science institutions and given formal names, this is from that fall in Northwest Africa), a Meteor wrong (many people think they find a meteorite only to find out it is not, this sample is magnetic and has a few other features common to meteorites but it is not a meteorite), an educational sheet about meteorites, a magnifying glass, 10X metal Eye Loupe and a neodymium magnet. This is a good set for people that have always had an interest in geology, astronomy, wants a good gift for their kids, or likes unique collectables..The Scale Object (photo cube) is not included in the kit it is there to show size of the objects. Do not put magnet in mouth and not for children under 3.